Get ahead of the game with our blogs by techno-superstars. Please enter your name. Please enter alphabets only for Name. Please enter Organization. Please enter valid email id. Please enter Phone number. Please enter numeric only for Phone number. Needless to say, like every other industry, Healthcare is at the forefront of transformation, digitizing every aspect of its existence- from network infrastructure to virtual care. Gone are the days where we wait for hours outside doctors’ clinics to check our analog temperature and lab results. Technology keeps evolving and there is so much potential in healthcare to help make medical care anywhere, anytime thereby reducing the risk of patient and physician burnout. The Healthcare industry is data rich and there are number of use cases spinning around IOT and Bigdata Analytics that offer the best patient care. Modern healthcare environment hosts large sets of fragmented information across multiple systems, networks and data centers across the globe. The bigger challenge is to inject a consistent yet healthy dose of next-gen technologies to deliver connected care and ensure security of cross-platform communication solutions. “Software Defined Networking” helps drive the adoption of “Internet of Things” by providing effective resource utilization, on demand bandwidth, adequate uptime, flow control, security and the sustainable quality of service. But we are still in the early days and it’s safe to say that all of us are on the lookout for SDN and IOT use cases. SDN at its very simplest is an approach to programming, controlling and managing the underlying network devices with a centralized management console via open interfaces. SDN takes networking solutions to the next level with its advanced routing policies by moving the intelligence i.e. packet forwarding function from the distributed network devices to a centralized controller thus simplifying network design, configuration and programmability. This Software centric controller uses OpenFlow or southbound protocols to control each device and traffic flow on the network. Network engineers can dynamically control and manage the networks using Network applications also referred to as Northbound Applications. These applications range from Topology management, Network provisioning, congestion control, Service insertion/chaining, Load Balancing, QoS management to Firewall Monitoring and Policy based Automation. Specifically, in Healthcare, as the patient data spreads into disparate cloud environments, the need for a stringent regulatory, QoS guaranteed network becomes imperative for reliable exchange of information. But there are a lot of pre-requisites that need to be adhered to. Networks need to be agile, virtualized and integrated to achieve high performance which is crucial for disaster recovery and business continuity. SDN together with NFV helps spawn and automate multiple virtual instances of networks in a fraction of the time taken by traditional networks. In a virtualized environment, Virtual appliances act as traffic managers and load balance the user flow to the appropriate data center across multiple computing resources. VMs moving across physical entities or data centers enable secured cross-platform cloud connectivity to data. Each Virtual instance can be delegated to each endpoint of a typical healthcare environment across areas like- Patient monitoring, Unified communications, Electronic Health records and Clinical Data. Each of these areas is as important as the other demanding reliable connectivity and good QoS to operate seamlessly. Now that the combination of SDN, NFV and Open source technologies is becoming increasingly significant, customers are beginning to realize the hype is indeed real. But understandably a lot of them are hesitant to take the proverbial leap without first going through an exhaustive list of real world success stories. Hemalatha MK is an Associate Manager with the Product Engineering Services business unit at Happiest Minds. She supports marketing and pre-sales activities with a special focus on SDN and NFV. 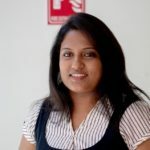 Hemalatha MK Hemalatha MK is an Associate Manager with the Product Engineering Services business unit at Happiest Minds. She supports marketing and pre-sales activities with a special focus on SDN and NFV. SDN is here to stay – Do you have an SDN validation strategy in place?